We were not so active for some time, but now – here we are again! 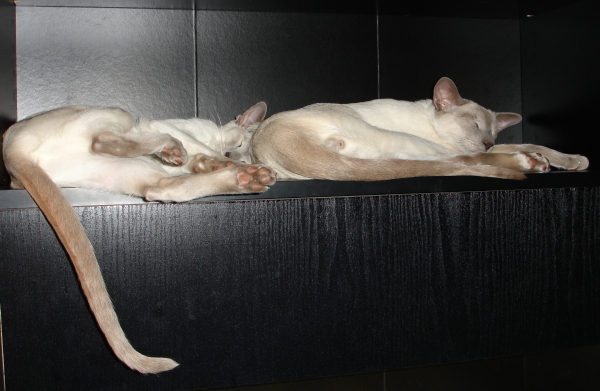 This is how it looks when Leroy and Jossan are sleeping in the flower cupboard (well, it was supposed to be a flower cupboard, but Leroy occupied one of the shelves for good, and Jossan followed. Our Saintpaulias still got 3 shelves, not that bad after all). I believe that people who love and understand animals should have them (thinking of it, ‘have’ is a bit silly word. I feel like my cats own me). I hope that you will have another Siamese friend in your life again. Thank you for your kind words about our cats. We love them and take care of them very much indeed.